Gone are the days where you’d hang out and watch movies, their dishes never seem to make it to the dishwasher and that pile of dirty laundry is starting to smell. Whatever the reason it’s time to break –up, with your roommate. It could be that you and your roommate just aren’t compatible, or maybe one of you has decided to move in with a significant other. The more common reason; you are ready to have your own space and independence. And as the old saying goes, breaking up is hard to do. Nobody wants to hurt someone’s feelings and you certainly don’t want any bad blood. We’ve put some tips together to help you get through the break-up in one piece. There are so many reasons that people don’t get along. Before making a hasty decision consider if your incompatibility can solved through talking it out. Discuss your concerns and see if you can reach some common ground. If your issues take on a more simple nature such as cleanliness see if the two of you can come up with a solution. Remember that having to find a new place to live and/or a new roommate takes time, can be quite the hassle and may end up costing you some money (and your sanity). Ensure that you have tried to work it out before going your separate ways, especially if your friends. That kind of break-up can leave you with some serious anger issues towards each other and may cost you a friend in the process. Like everything in life, timing is everything. Make sure you’re not springing this on your roommate and make sure that when you do bring it up, your roomie has time to fully discuss the issue (not when their heading out the door). Find out in advance when they are free so you can sit down and hash things out. Be fair. If your discussion leads to one of you moving out, consider the time it will take for you to figure out the finances, split possessions if necessary and allow yourself or your roommate to find another place to live. Don’t walk away angry! This may lead to a very tense living situation and will press the urgency to go your separate ways as soon as humanly possible. Be direct, but gentle. Try to get to the point but not in a way that comes off as harsh or cold. You don’t want your roommate to get upset or feel ambushed. Find a way to say what you need to say while remaining calm and respectful. Also, don’t tell your entire pool of friends about your impending break-up; you don’t want your roommate to catch wind of the gossip before you can have a conversation. Like the good therapist says, use “I” statements. Try using constructive conversation instead of confrontational. Whether they never pay rent on time, leave dirty dishes or a trail of messes in their wake; avoid the word “you”. 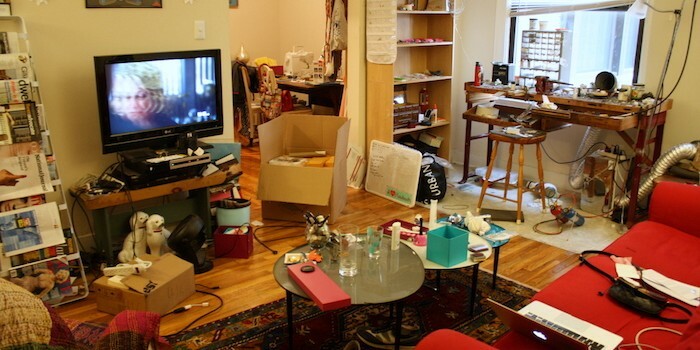 Whether you went halvsies on a tea kettle or the big screen TV, try to fairly divide your possessions. There’s a reason divorce lawyers can retire off of their clients. Put together a list of items that you have acquired while living together and figure out what will be fair and make sense. Maybe one uses the item more than the other, can you reimburse one another for items that cost a lot? Although inanimate objects are just that, they may hold more value or meaning for one you. Remember that compromise goes a long way. Just because you have ended your roommate relationship doesn’t mean that your legal one will go with it. Consider that there are still rent and utilities that may need to be paid. If you are the one moving out ensure that your roommate has rent for the month and you have covered any outstanding utilities. Even better ensure that they have a new roommate before you move out. It’s your responsibility to continue paying rent and utilities if you leave before the lease is up and your roommate is unable to afford the place on their own. Find someone to sublet if you can. Try talking to your landlord and see if you can come up with an arrangement that will make everyone happy. Mend the gap. If you value your roommate’s friendship, make sure to keep in touch after one of you moves out. If you’re the one who moved out, you should be the first to reach out. Try inviting them over to your new place for drinks or a game night. Remember that the awkwardness will eventually fade, but like with any relationship; it takes time, patience and a little bit of effort.